This is an interesting website that you may wish to visit every now and then ( www.stawealth.com) . This chart is freely available on this website so I am reproducing it to alert you to its existence. It is an excellent website. Shown here are 1. 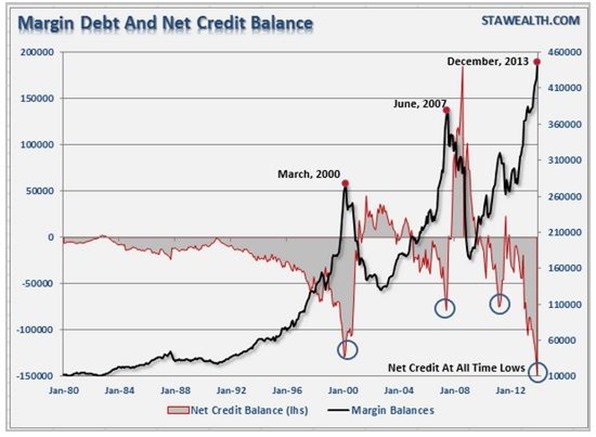 Margin debt, that is how much money is borrowed against stock as collateral and 2. The net credit balances of mutual funds etc. The first has never been higher and the second never lower. Both are expressions of an unbelievable bullish outlook on the market. And, by the way, the correlation between the margin debt and the stock markets, say the Dow or the S&P is readily apparent. What we are still missing is a good chart of the number or value of stocks that have been bought back. My understanding is that over the past 12/13 years the total for buy-backs is now running at $3.1 trillion, which, by the way, is about three times as much as the entire assets under management in the Canadian mutual fund business. Some things just keep on going un till, of course, they stop.